After many a discussions (In the wrong threads hehe) with some people who use some of the more floral flavorings, like Ylang Ylang, Jasmine, Violet, Hibisucis, Honeysuckle, etc etc… we decided to start a thread in the hopes we can expand our recipe knowledge to include some of these flavoring we all enjoy! Granted they are an acquired taste for many but if done correctly, even the worst critic can find themselves enjoying them! So feel free to leave your suggestion, success stories or even inquiries about these flavors! Because I know I would love to use them more than I already do!! What juice helped you quit smoking? Yea I'll check it out. I made your last straw cucumber. It's steeping ATM. I think it's an interesting mix since you typically only see cucumber paired w/ watermelon or mint. I'm thinking Ylang Ylang may be good with a hint of lemon and splash of lavender but I don't have lavender yet. I would go 0.2 lavender lemon could be a top note and Ylang Ylang background lavender hint. I am currently seeking a recipe/suggestion on violet that isnt a candy. I have FA’s Violet and its wonderful but very limited for me at the moment- I plan on using a current recipe of mine and subbing Violet for the Hibiscus…fingers crossed! Honeysuckle pairs well with blueberries and blackberries and a splash of honeydew. Maybe even an Acai Berry may fare well in there as well. bb extra i had it at 10% but i’d prob drop that to about 8% and then honeysuckle at 5% but i’d also drop that to about 2% .It was good as it was but my tastes have changed is all. @Amy2- So I just did a side by side comparison of both versions of the Catalanga Ylangs and even though they are both great in my opinion the vr 2’s ylang does come through a lot more in a very unique way! So i’m thinking of coming up with a hybrid between the 2 and see what I can get! The original is extremely light on the exhale where as the 2nd vr is more prominent. The only reason I can come up with as to why is the first vr is higher on the Bavarian/creams plus has the blood orange in it but they both have the same amount of ylang in them. It’s pretty damn exciting though and I’m going to make it my mission to perfect this hybrid and then my other recipes can branch off of this! Kewl ! I’ll try it out maybe tomorrow. Ginger. Or if you make a " aged " like juice and you want the accent of a barreled effect say a wine or a bourbon accent I think it sounds like you could use this flora/ scent in that setting. I don’t have zen Gardens haven’t felt drawn to it. I do think summer clouds should be placed in this category as it is flora and seems like it doesn’t have a good following mainly Bc of this. It can be difficult to work with. Trick is start 1-2% add an exotic only top note use a main flavor that will compliment and not compete with summer clouds. I like mango and marshmallow so far best. I want ginger so bad! I didn’t see it on my last purchase, hopefully next time! Do you have it? I agree with summer clouds as well, haven’t tried with mango yet but definitely marshmallow and toasted even. Im glad you have the same “rarely used” flavors that I do…much easier when you have someone to bounce ideas off of! Hmm unicorn vomit I have it as well I’d say it’s closest to a passion fruit mix with some deep dark berries mixed in. Difficult to mix w/ start low 0.5- 2% it has been a headache to find a good balance. My guess if I had to throw out an idea is it would compliment a soft cream not TFA’s that one is too buttery milky creamy. I would think more on the lines of FA fresh cream or probably oba oba up high like 5-7% oba and 0.5-1% unicorn vomit and the spin the tar out of it and then steep. Dark berries need air and time. No I don’t have ginger lavender or violet but I want them. I just keep forgetting everytime I get stuff. Been wanting them for a while. On a side note if you like spices try out INW shisha punch it is a strong spicy blend w/ hints of gingerbread , clove , cardamom and cinnamon. The Merlot is of a sangria quality you mean ( mixed fruit ? ) or you mean your thinking about making a sangria with it ? I had some red wine FA but tossed it it was so nasty. 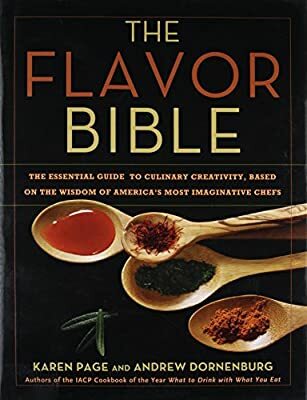 I don’t know if you ever saw the book I posted a month ago or so (The flavor bible) but that book is great! Ironically enough, I bought it years ago for the kitchen and I never actually used it but now I use it for ideas and it’s great! Awesome Bc I am vegetarian and love to use spices and I want to start an herb garden. I want to start trying flowers in salads so that book sounds valuable in my house in more than one way ! I wonder is it available in a kindle format ? I’ll try those recommendations on that unicorn. Completely off topic, I’m not a vegetarian, although Im big into raw and the vegetarian lifestyles. I have opened a few vegetarian, vegan and organic restaurants and have tons of books, recipes and resources if you ever need some inspiration! I know how hard it is to change things up and live that life, just let me know I would be more than happy to send ya some info! Sure ! You can PM me some links. Someone else here did the same thing once. Such nice ppl on this forum ! I have a vegetable book like that huge book gives orgin species and a simple description cooking and common dishes. I think it’s from the early 90’s. The citrus Cananga is Amazing ! It tastes exactly what I’d hoped it would. Inhale creamy then slight Orange and then exhale is Ylang Ylang with hints of orange. this is super good. I only made a tester of it. I know what I’ll be doing later today ! I made a nice 60ml bottle eventually though. Its too bad you’re not a fan of pomegranate cause that one is nice too BUT I’m eager to hear how that acai vr turns out!! Oh I plan to try it out as well. And btw I’m trying it on a 1.8 ohm kanger coil switched out with Japanese organic cotton on a p3 vv/vw spinner easy chill set up. I bet this would rock in my Natulius but ATM it is being a huge PITA d/t knock off coils is all I can think of very temperamental as well as my mini version. I got coils at fast tech but they claim their original idk i don’t think they are nothing but problems w/ them. So anywho I’ll hopefully remember to buy some again and try the citrus Cananga in it once I get them. Thank you this is such a nice recipe ! 5stars is well deserved ! My 2 nautiluses are kinda buggy as well, I get spit back a lot more than I like. I usually twist a paper towel down through the drip tip to the atty and that helps a lot. Do you have this issue at all? Im actually using my crown with the cananga atm and I think I may take back what I said. Im REALLY enjoying it between 50-60 watts! !